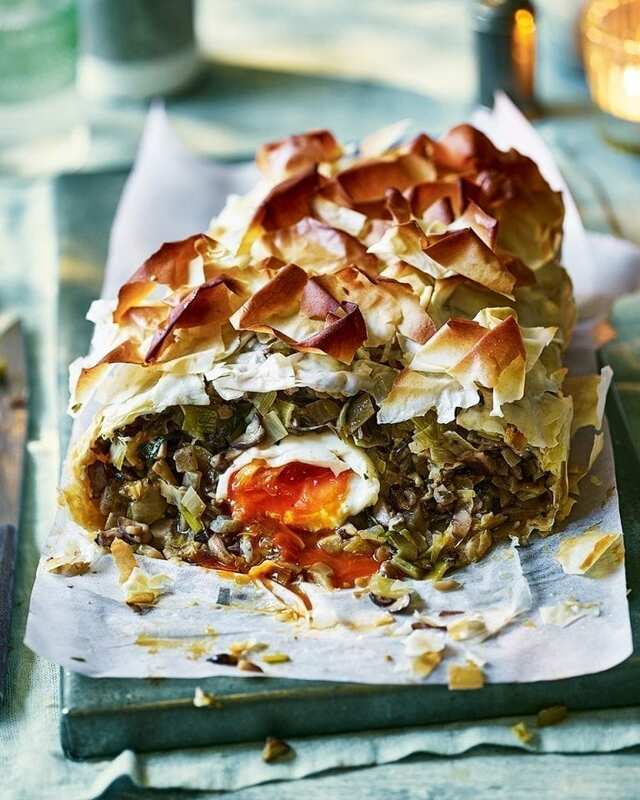 This impressive vegetarian pie is packed full of mushrooms, leeks, cheddar cheese and gooey, soft-boiled eggs making it a filling dinner party main. In a large frying pan, melt 25g of the butter and a glug of oil until the butter begins to foam. Add the onions and leeks, then fry for 10-15 minutes until softened and starting to caramelise. Add the garlic and cook for 1 minute, then remove with a slotted spoon and set aside on a plate. Melt the rest of the butter in the pan and add another glug of oil, then turn up to a medium-high heat and fry the mushrooms until softened and golden. Return the onion and leek mixture to the pan, pour in the sherry and bubble for a minute, then stir in the tarragon and plenty of seasoning. Set aside to cool completely. Stir in the cheese and mustard once cool. Meanwhile, boil the eggs for 4-5 minutes (depending how runny you like your eggs), then remove with a slotted spoon and put in a bowl of iced water. Once cool, peel and set aside. Heat the oven to 220°C/200°C fan/gas 7. Layer 2 sheets of the filo lengthways in the prepared loaf tin so they overhang the ends, brushing with oil as you work, then layer 5 more filo sheets widthways, also leaving a large overhang on both sides of the tin. Continue to brush each sheet carefully with oil as you work. Once the tin is completely lined, spoon in half the mushroom filling. Make 3 shallow indentations in the mixture with the back of a tablespoon and put a boiled egg in each one. Cover with the rest of the mushroom mixture, then fold over the overhanging filo pastry. Roughly scrunch up the remaining sheet and use it to top the pie. Brush again with oil, then bake the pie for 30 minutes until the pastry is golden and crisp. Leave the pie to cool in the tin for 5 minutes, then use the overhanging strips of baking paper to lift the pie out onto a board. Serve with glee. Use older eggs in this recipe as they’re easier to peel after boiling. We used Burford Brown eggs for their bright orange yolks. Bake up to 24 hours ahead, cover with cling film and chill. Serve at room temperature. Our friends at Majestic Wine recommend Olivier Dubois Cuvee Prestige Pinot Noir. This French pinot noir has bright acidity and gentle tannins. Both aspects are crucial for underscoring the earthiness of this delicious mushroom pie.